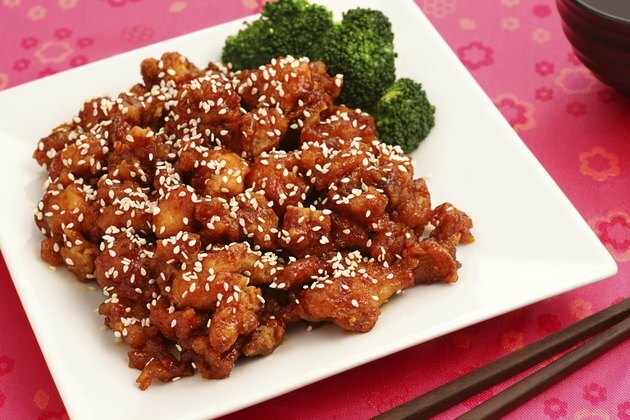 Sesame chicken is a common option in Chinese restaurants and is also available frozen at many grocery stores. To make the dish, the chicken is traditionally marinated in a mixture of soy sauce, sesame oil and salt before being deep-fried. The chicken is served in a sauce featuring ginger, garlic and sesame. The chicken is generally accompanied by white or brown rice but fried rice is sometimes used. The exact recipe and therefore the nutritional values of this meal varies. According to nutrition website The Daily Plate, a 10-oz. serving of sesame chicken generally contains about 430 total calories. The dish provides 19.5 g of fat, 27.9 g of carbohydrates and 37.8 g of protein. Some healthier options roast the chicken instead of frying it, which greatly reduces the fat content. These recipes also commonly include more vegetables. A meal of roasted chicken with vegetables contains 230 calories, 6 g of fat, 35 g of carbohydrates and 12 g of protein. Fried rice is a side dish that can also be prepared in a variety of ways. Proteins such as pork and shrimp are sometimes added to the rice, which will significantly change the nutritional content. A 10-oz. serving of plain fried rice provides around 330 calories with 11 g of fat, 51.7 g of carbohydrates and 6.6 g of protein. Sesame chicken paired with fried rice can be a beneficial meal. It is a good source of healthy carbohydrates and protein. When vegetables such as peas and carrots are added to the meal it will provide fiber, vitamins and minerals. The large amount of oil used to deep-fry the chicken and prepare the sauce, however, contributes high quantities of fat to the dish. The soy sauce used in the marinade and sauce also contains high levels of sodium. The eggs sometimes used in fried rice will also add fat and cholesterol. Roasting the chicken instead of frying it will lower the total fat content of the dish without compromising the protein content. Add vegetables such as carrots, bell peppers and peas. Use white or brown rice instead of fried rice to make the dish lighter and greatly reduce the total calories and fat content.